By day a Careers Adviser at the University, Annette won a gold medal for Zimbabwe at the 2015 World Ice Swimming Championship. It’s Murmansk, Russia, and the April air temperature is below freezing. More pertinently, the water into which you are about to step is at freezing point – and you’re going to be spending the next 20 minutes or so swimming in nothing more than a bathing suit. You raise the flag of your native country above your head, and the crowd go wild. How do you feel? For Annette, it was the pinnacle of a remarkable adventure – one that saw her transported to the realms of superstardom for five days. Now, back on campus with her feet firmly on dry land, the story unfolds equal parts bravery, eccentricity…shivery. Training at a quarry lake on Bodmin Moor, Annette completed her first ice mile in 2014, becoming the 74th person to achieve the feat. Despite enjoying the experience, a back injury took her out of the water for a number of months, and it was only when she applied to take part in the World Championships – and was accepted to represent Zimbabwe – that things really began to happen. There’s something about swimming in really cold water – it’s the mental challenge for sure, but you also get this tremendous endorphin rush afterwards. For an ice mile to be officially ratified, the water has to be below 5º Celsius in three separate readings, and must be videoed and ratified by observers. Simply finding water that is cold enough can be a challenge in the UK, and meant Annette had to find some truly novel ways to acclimatise. 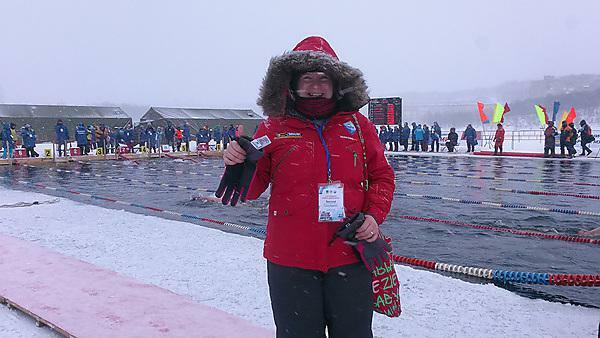 Annette completed her second ice mile at the Lough Dan Invitational Ice Mile in Ireland in February, braving 3.8º water, and then set off for the combined World Ice Swimming Championships and Russian Open Water Swimming Championships in March. Touching down with competitors from 15 nations, she found herself greeted at the tiny airport by media, personal translators, regional dignitaries, and the warmth of a hugely excited local population. Just 24 hours later, she was led out for her ‘heat’ in a pool that had been carved by chainsaw out of the ice of Lake Semenovskoe. Annette took 21 minutes to swim the one-kilometre course – securing a gold medal for her age category as a result. Over the next two days, at the same venue, she took part in four sprints and finally a 450m race in which she won a bronze medal. She describes this as the hardest race of the competition as she had not yet recovered from the previous five races. Plenty of others didn't even get that far – thorough medicals before each event saw some athletes refused permission to compete, while ‘seconders’ watched each competitor closely for signs of fatigue, with some forced to retire, even with mere metres remaining. Annette is keen to repeat the experience at the 2017 World Championships in Germany, and with ice swimming potentially becoming a Winter Olympic sport, the possibility of representing Zimbabwe on the coldest, grandest stage is not beyond the realms of possibility. Mother, careers adviser, torch-bearer?